Successful fundraising requires the commitment, and creative enthusiasm of many. Therapeutic Adventures needs community advocates—civic and corporate partners who embrace our mission and who will work together to leverage significant support to meet critical needs of our organization. 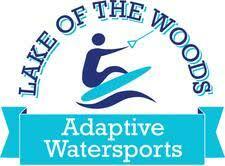 Your business or foundation has an opportunity to enrich the lives of our adaptive athletes. When you partner with Therapeutic Adventures, you help us to be a premier provider of adaptive sports, adaptive outdoor adventures, and other speciality therapeutic services. Now in its 15th year, the ADAPTIVE ANGLERS ON THE FLY – Fly Fishing Camp for Disabled is offered at the Moormans River Trout Management Area. is provided at Montfair Resort Farm and the Moormans River Trout Management Area.This event is provided in partnership with Thomas Jefferson Trout Unlimited (TJTU), and Montfair Resort. 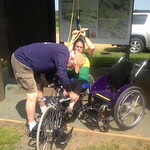 It also allows us to raise awareness for accessibility and eco-stewardship of this beautiful environmental area. Plunge participants may register as individuals or as a team.Teams should have a minimum of 3 participants. No team registrations will be taken on the day of the plunge. Each plunge will be limited to 25 participants and will take place in 30 minute increments. Participants may use the steam room, sauna, hot tub, and/or indoor pool after their plunge and may change in the locker room areas. Spectators will not be allowed access to the Woodstone Recreation Center without a recreation pass. Please arrive early to allow time to check-in. Parking will be limited, so help us out and carpool with your team! For close to 4 decades,TA staff has been honored and privileged to provide adaptive outdoor programs for disabled Veterans who have represented our great nation defending the freedoms we all enjoy. Our program, OPERATION FREEDOM OUTDOORS — Serving our Disabled Military Heroes, provides adaptive instruction and guide services, unique mentoring experiences, and personal development to aid in the healing, rehabilitation and re-integration of disabled active duty service members, veterans and their families. We have worked with military after they have returned home from serving in the Korean War, Vietnam, Bosnia, the Gulf War, Afghanistan, and Iraq. We have also worked with those who are victims of war and oppressed societies such as Somalia, and some Eastern European countries. The OPERATION FREEDOM OUTDOORS – Adaptive Snow Sports Weekend for Disabled Military Heroes is provided at Massanutten Four Seasons Resort. 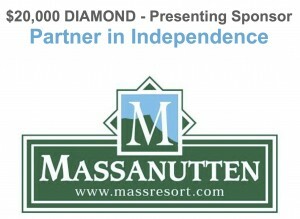 Now in its 21st year, the INDEPENDENCE CUP – Adaptive Snow Sports Race and Celebration of Independence Awards Ceremony is provided at Massanutten Four Seasons Resort. Each winter, this event highlights all the hard work, training commitment, and new found independence that our adaptive athletes discover on the slopes. Not to mention, those who attend will also experience the creative enthusiasm of all our wonderful volunteers who show up in costumes. Now in its 13 year, the SPRING FLY FLING – Fly Fishing and Therapeutic Outdoor Retreat for Women Cancer Survivors is provided at Montfair Resort Farm and the Moormans River Trout Management Area.Throughout the weekend, the women are treated to “Rustic Elegance —Therapeutic Adventures — Outdoor Fun — Well Deserved Respite.” This event is provided by our ALL volunteer staff in partnership with Thomas Jefferson Trout Unlimited, Montfair Resort, Sentara – Martha Jefferson Cancer Center, the MJH Foundation – Women’s Committee, and many business partners. A tremendous amount of love and healing occurs as the women go through all the special activities that are a function of the event. As they say, we are all part of a bigger “Bug SlingerTM Warrior Sisterhood”. Now in its 11th year, the Run the Valley – Park to Park 1/2 Marathon ~ Stuarts Draft ➝ Waynesboro is a favorite of local runners and those from other parts the country who wish to participate in a quality race with beautiful views of the Blue Ridge Mountains. Over the past ten years, more than 6,000 runners have made there way to the Shenandoah Valley the last Saturday of April to embrace the importance of this “Run for a Cause” event. Corporate gifts play an important role in supporting the adaptive programs, projects, and events we provide to hundreds of adaptive athletes each year. A philanthropic partnership with THERAPEUTIC ADVENTURES provides businesses with the opportunity to support adaptive sports and adaptive outdoor adventure programs as well as other specialty clinical services we provide for our adaptive athletes. 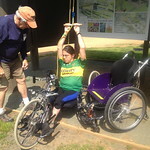 Your partnership with Therapeutic Adventures also helps to showcase your company’s commitment to improving the health and well-being of persons of all ages with differing abilities: (physical and developmental disabilities, cancer survivors, disabled military heroes, and persons with chronic health impairments). Various forms of Corporate Giving include Sponsorship of an Event, Adaptive Equipment, or an Adaptive Program. Please see the list of all upcoming and current sponsorship opportunities. For additional information, contact us at THERAPEUTIC ADVENTURES and write “CORPORATE GIVING” in the subject line, or call (434) 981-5834. Therapeutic Adventures and the fundraising family of TA supporters touches the lives of so many individuals in our community and throughout mid-atlantic region. Some of those people who support our cause may be employees of your company. Thank you! As a nonprofit 501(c)(3) charitable education organization (Tax ID: 54-1779203), Therapeutic Adventures relies on support from corporate partners. Therapeutic Adventures is approaching 40 years of service and is widely recognized as an innovative leader in the adaptive sports, and adaptive outdoor adventures professions. 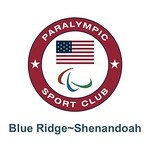 As a Paralympic Sport Club, we are affiliated with an important national movement. If your company is looking to invest in a charitable cause with a lasting impact and high visibility, we want to hear from you. By partnering with TA for your “Cause Marketing” efforts, you build your business brand, and you empower your employees to do more good in the communities where they reside. Call us today at (434) 981-5834 or email info@TAonline.org. At Therapeutic Adventures, we are primarily an ALL volunteer organization.We rely on our trained community volunteers and university student volunteers to carry out our mission.When local companies go above and beyond as community partners to encourage their employees to volunteer with local non-profit charities, everyone benefits. Please see the list above of all upcoming and current sponsorship opportunities. 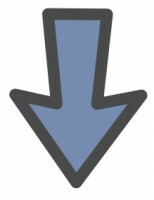 Does your business value the importance of supporting the work done by local charities/non-profit organizations? Do you have employees who are looking for ways to give back to the community? If you answered “Yes” to either or both of these questions, then a partnership with Therapeutic Adventures may be the perfect opportunity for you and your employees. We love it when the employees of a company join forces and work together to expand on all the good that can be done.The good news is that’s exactly what’s possible through your employer. 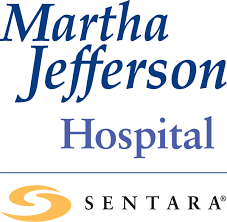 It’s easy to double your impact just by participating in your employer’s matching gift program. 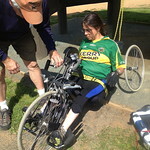 Please consider joining forces with us to make a significant impact on the health and well-being of our adaptive athletes: (1) Volunteer, (2) Donate. When companies agree to match the donations their employees make to non-profit organizations, then we can serve more people and make twice the impact. Thank you for Matching Gifts! What if your giving can be doubled, resulting in twice as many lives affected? Through your company’s “Matching Gift” program, you can. Wouldn’t it be great if every gift you gave DOUBLED in size? Read more about how you can maximize your contributions and impact twice as many adaptive athletes.